The following list contains publications that describe Gwyddion, its architecture, individual components, algorithms, and other parts of the ‘Gwyddion ecosystem’ or are related to the software in some other fundamental manner. The goal is not to gather here all papers mentioning that Gwyddion was used for data analysis. Such papers, while gratifying and encouraging futher development of the software, are quite a few and you can get them Scopus, Web of Science or a similar database if you are interested. A list of publications where Gwyddion was utilised may be added in future if we figure out how to manage such thing reasonably. Generally, the list contains publications by Gwyddion contributors about things inherently gwyddionic. But third party publications are not excluded. For instance papers describing a data analysis system built on top of Gwyddion libraries or third-party extension modules can be good candidates for inclusion. If you think your publication should be mentioned here please do not hesitate to contact us. The book is accompanied with freely available sample data. 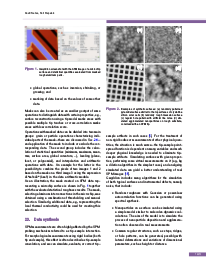 Abstract: In this article, we review special features of Gwyddion—a modular, multiplatform, open-source software for scanning probe microscopy data processing, which is available at http://gwyddion.net/. We describe its architecture with emphasis on modularity and easy integration of the provided algorithms into other software. Special functionalities, such as data processing from non-rectangular areas, grain and particle analysis, and metrology support are discussed as well. 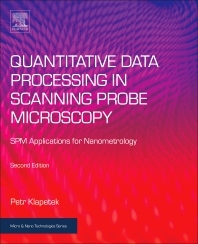 It is shown that on the basis of open-source software development, a fully functional software package can be created that covers the needs of a large part of the scanning probe microscopy user community. Abstract: We present a software library and related methodology for enabling easy integration of adaptive step (non-equidistant) scanning techniques into metrological scanning probe microscopes or scanning probe microscopes where individual x, y position data are recorded during measurements. Scanning with adaptive steps can reduce the amount of data collected in SPM measurements thereby leading to faster data acquisition, a smaller amount of data collection required for a specific analytical task and less sensitivity to mechanical and thermal drift. Implementation of adaptive scanning routines into a custom built microscope is not normally an easy task: regular data are much easier to handle for previewing (e.g. levelling) and storage. We present an environment to make implementation of adaptive scanning easier for an instrument developer, specifically taking into account data acquisition approaches that are used in high accuracy microscopes as those developed by National Metrology Institutes. This includes a library with algorithms written in C and LabVIEW for handling data storage, regular mesh preview generation and planning the scan path on basis of different assumptions. A set of modules for Gwyddion open source software for handling these data and for their further analysis is presented. Using this combination of data acquisition and processing tools one can implement adaptive scanning in a relatively easy way into an instrument that was previously measuring on a regular grid. The performance of the presented approach is shown and general non-equidistant data processing steps are discussed. 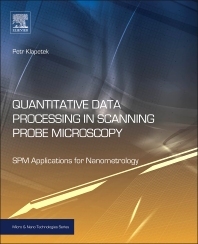 Abstract: The quantitative results obtained using scanning probe microscopy (SPM) are influenced not only by instrumentation factors, but also humans—the SPM users that perform the data processing and the evaluation of statistics, dimensions and other parameters from the images. We investigate this user influence empirically by performing several experiments in which real humans process SPM data in different settings using the same software, and statistically characterise the results. Two types of experiments are conducted: one in a well-defined laboratory setting where prescribed procedures requiring user input are applied by experienced users to large ensembles of similar data; the other in an open setting in which a large group of SPM users evaluate the same images to obtain specified parameters but without external guidance. The open study in particular brings about results that should be alarming for the SPM community and SPM metrology in particular. We also attempt to derive some guidance for the design of SPM data processing software functions from the results and classify the amount of user input in the data processing functions. Abstract: Present atomic force microscopes are capable of acquiring large data volumes by point using point force-distance spectroscopic measurements. 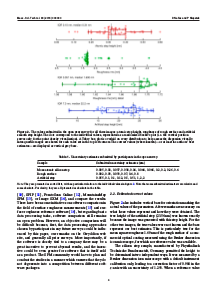 Even if different trade names and different technical implementations are used, for most of these techniques a force-distance curve in every image pixel is measured, this curve is immediately fitted by some theoretical dependency and results are displayed as a mechanical properties channel (Young modulus, adhesion, etc.). Results are processed during the measurement directly in the SPM controller or, after it, by manufacturer provided software. In this article we present a software tool for independent numerical processing of such data, including more numerical models for force distance curves evaluation and including a simple estimate of uncertainties related with fitting procedure. This can improve the reliability and the analytical possibilities of mechanical properties mapping methods in atomic force microscopy. 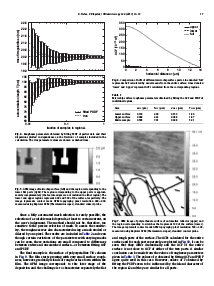 Abstract: Scanning probe microscopy (SPM) can be effectively used for evaluation of nanoscale roughness of surfaces obtained by different technological processes. 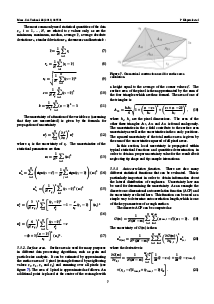 Spectral properties of surface roughness can be evaluated using algorithms based on Fast Fourier Transform (FFT). For data that are not rectangular, this approach, however fails. In this article we describe a modification of SPM data evaluation algorithms enabling to use FFT based approach even for irregular and non-continuous data. 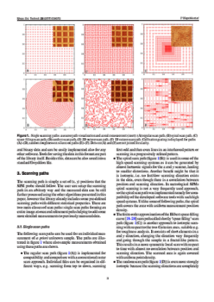 This opens novel possibilities in analysis of local surface roughness in many fields, e.g. on nanoparticles, semiconductor structures or any other nanostructured samples prepared using nanotechnology methods. Together with theoretical description of proposed method we present benchmarks for its performance and typical results of its application on different samples. 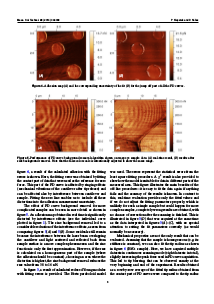 Abstract: This paper describes the processing of three-dimensional (3D) scanning probe microscopy (SPM) data. It is shown that 3D volumetric calibration error and uncertainty data can be acquired for both metrological atomic force microscope systems and commercial SPMs. These data can be used within nearly all the standard SPM data processing algorithms to determine local values of uncertainty of the scanning system. If the error function of the scanning system is determined for the whole measurement volume of an SPM, it can be converted to yield local dimensional uncertainty values that can in turn be used for evaluation of uncertainties related to the acquired data and for further data processing applications (e.g. area, ACF, roughness) within direct or statistical measurements. These have been implemented in the software package Gwyddion.